The Global Focal Points for coordination provide surge capacity and desk support to country-level clusters. They are available for up to 1 month missions. The Roving Focal Points are available for up to 3 months. Assessment support is provided through the Global Focal Point for Assessment Monitoring and Evaluation Contact details of the Global Focal Points and the Roving Focal Points. The Coordination Toolkit provides tools and templates that have been used and tested. Some of them are translated in various languages. 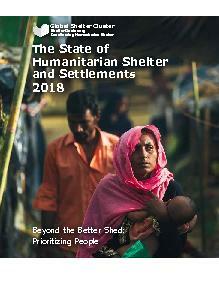 This Shelter Projects publication and website provides case studies that can be searched by country, year, and theme. Building a better response: Online training on the Humanitarian Reform, the Humanitarian Programme Cycle and other related issues. The Global Shelter Cluster Youtube channel gathers shelter videos from the Global Shelter Cluster partners.